Mangaluru, March 20, 2016: As Chief Minister Siddaramaiah mentioned about constituting a corporation for implementing the Yettinahole and Upper Bhadra projects in his budget speech, green activists vented their anger here. They defaced the photographs of D.V. Sadananda Gowda, B. Ramanath Rai, K. Abhayachandra Jain and U.T. 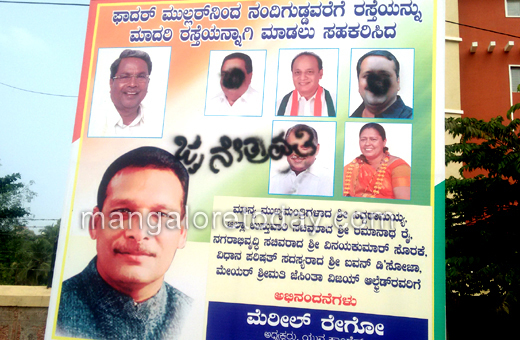 Khader in the banners and hoardings put up in the city. According to the activists of the Sahyadri Sanchaya, a registered body of green activists fighting against the Yettinahole project, the photographs in 11 banners and hoardings were defaced in Urwa Stores, Kankanady, Valencia and at Kottara. 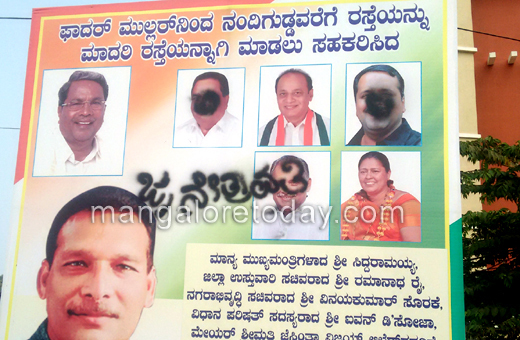 An activist said that the photographs were defaced as CM Gowda had given administrative approval for the project. The other three should have raised their voice against the project with the government. Instead, the activist alleged, the two ministers were favouring it. The activist said that Minister Rai had called the activists of Sahyadri Sanchaya as “chameleons”. Hence the defacement. Meanwhile, in his budget speech, the Chief Minister mentioned that an experts’ committee would be constituted to study and report on the availability of water from other alternate sources along with Yettinahole project to provide permanent irrigation facility to drought prone areas of Chikkaballapur and Kolar districts. He said that a “coordination committee will be constituted for the early and effective implementation of Yettinahole Integrated Drinking Water Project”.